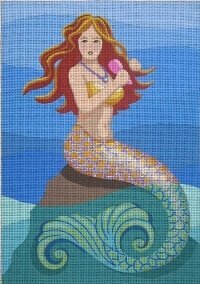 This Mermaid with Brush needlepoint design is handpainted onto 18 mesh Mono Zweigart needlepoint canvas. The design area measures 7" x 10". This JulieMar needlepoint design is sold canvas-only or with fibers. if you select cotton we will send DMC embroidery floss; if you select silk we use Pepperpot Silk by Planet Earth which is single ply for 18 mesh. If you want to add a little sparkle to your mermaid's tail, choose Mixed threads from the drop down menu and we will add some Glisten from Rainbow Gallery to your silk threads. If you need stretcher bars we recommend a set of 11" and a set of 14" bars and some thumb tacks.